A passenger jeepney and a van got involved in a road accident in Bontoc, Mt. Province around noon on Monday (May 25). The jeepney just came from the provincial capital of Bontoc and was on its way to the town of Besao. 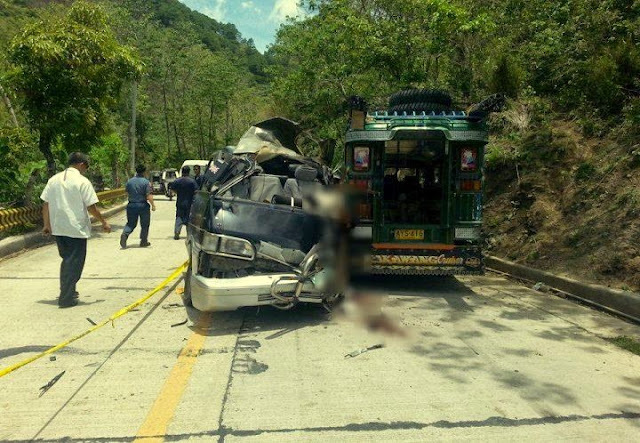 The collision happened near the tunnel (usok) in Bontoc Ili. The driver of the van has been confirmed to have died during the crash. He hasn't been named yet but posts on social media say he's from the province of Kalinga and married to a woman from Camatagan, Sabangan. The van he was driving was plying the Abatan 90 route. Passengers from the two vehicles were rushed to a hospital for treatment and observation. I don't know if there are any other casualties or if any of the passengers were seriously hurt. I will update this page when more information comes in about the incident. For the time being, always drive safely when you're on the road. Accident site. Photo by Kinad Waytan.